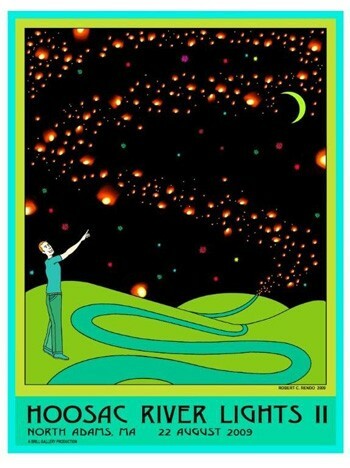 A poster designed for Hoosac River Lights by Eclipse artist Robert Rendo. 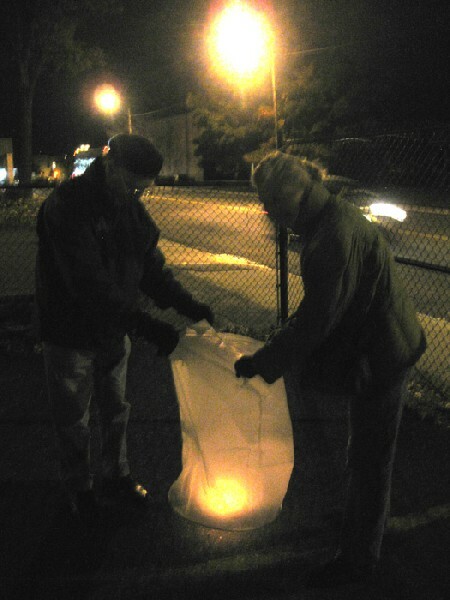 Ralph Brill distributed the lanterns. Giuliano photos. Brian and Leanne Jewett on standby. 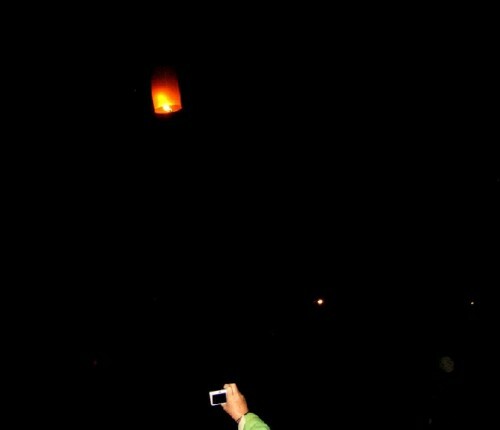 Ralph helping the Jewetts to launch their lantern. The drummers laid down an awesome beat. Gail and Phil Sellers enjoyed the occasion. Brill assisting Astrid Hiemer and Susan Graber. 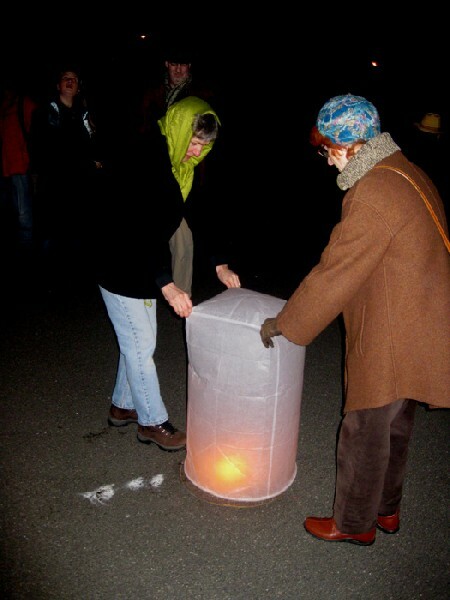 Susan and Astrid getting ready to launch their lantern. 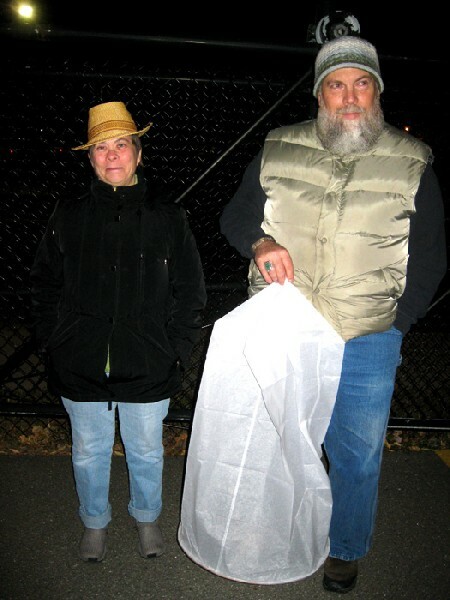 The Rockewells with their lantern. 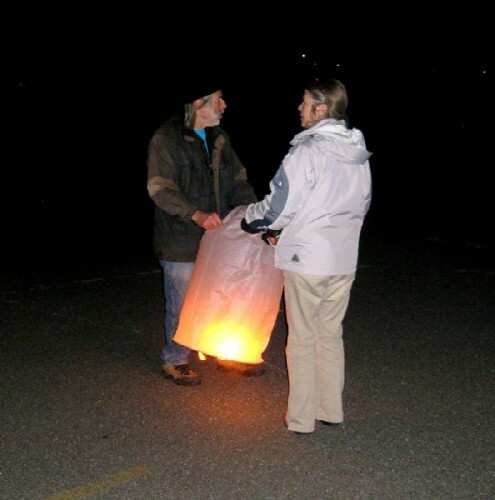 The Second Annual Hoosac River Lights event planned for the summer was a washout. 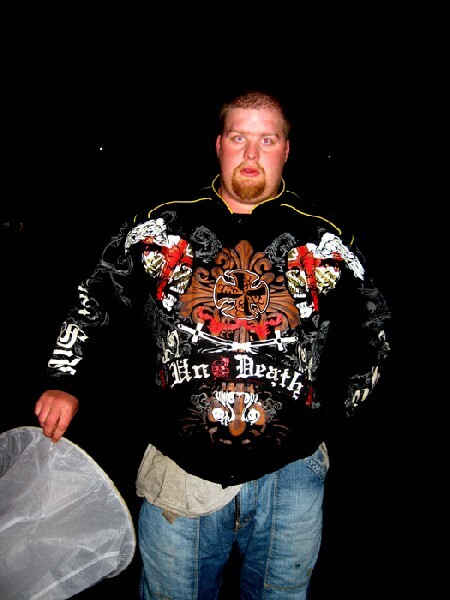 It was yet another activity impacted by the Berkshire Monsoon of 2009. There was a indoor laser show as a part of that event which was spectacular but sparsely attended. Ralph Brill, a trained architect, visionary artist, and gallerist rescheduled the event for the weekend of the Fifth Annual North Adams Open Studios which concludes today. He operates Brill Gallery on the first floor of the Eclipse Mill just across the hall from the River Hill Pottery studio of Gail and Phil Sellers. 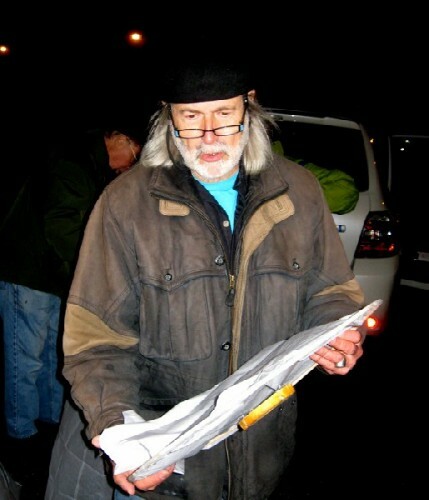 This year Phil had been the chair of Open Studios and already has ideas for the 2010 event. Once again weather has proved to be a factor. The prognosis of rain and cold dampened spirits and the turn out was lighter than in the past couple of years. It was a long day for artists, all over North Adams downtown, at the Eclipse, Beaver, Delftree (North Adams Museum of Art), and Windsor Mills. They were open from 10 am to 5 pm. In general there were reports of light turnout in the morning with peak traffic mid afternoon. The artist, Dawn Nelson, of the Eclipse Mill hosted a dinner of home made, three bean chile and salad for her neighbors. She was upbeat saying that preparing the dinner gave her something to do all day while greeting the flow of visitors. The artists attending were tired but energized sharing insights of the day. 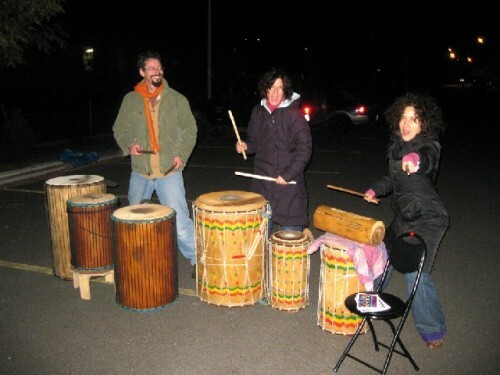 Everyone planned to move on to participate in Brill's event staged in the vast parking lot behind Big Y which is bordered by the Hoosac River Canal. In the 19th century the canal was essential to provide the power that ran the mills situated along its banks including what in its last incarnation was Sprague Electric before morphing into Mass MoCA. Discussing the river event and light show Ralph left early to set up and advised us to come around 8:30 PM. Upon arriving we found ourselves recruited as participants in the happening or action as they call it in Europe. Gathering around Ralph explained the concept of the sky art work. He passed out what he described as Cambodian lanterns. When unfolded they are tubes constructed from rice paper about three to four feet high. At the bottom the paper is attached to a bamboo ring. In the center of which is a candle wax ring that is ignited. When lit the hot air inflates the tube creating a wonderful glowing effect. 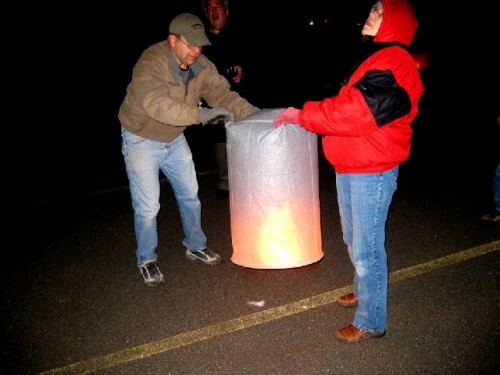 Each lantern required a two person team to keep the structure expanded and to prevent the paper from catching fire. "Don't worry" Ralph assured us, there were large bottles of water on hand in the event of a mishap. He commented that in the early 1900s North Adams was known for ballooning. So there was a local, historic touch that went along with the documentary intent of the Hoosac River project. The Hoosac projects are designed to call attention to tradition and natural recourses which are embedded in the social and economic development of the region. The teams of artists participating in the event were instructed to spread out to the edges of the enormous parking lot. When all of the lanterns were lit the teams were told to slowly walk toward the center. This was coordinated with three drummers laying down a beat. Some of the artists started dancing in a freeform, tribal manner. It was motivated by feeling the beat as well as circulating blood on a frosty night. 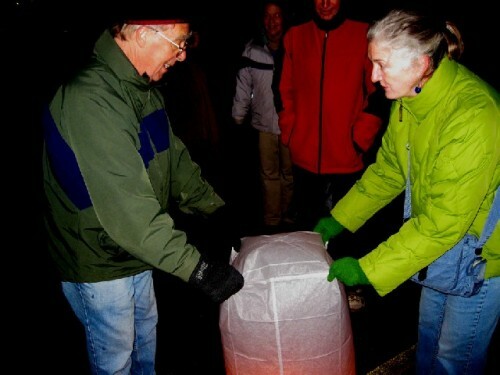 Rather cautiously Brill planned to launch just a single lantern. It was a matter of what were the prevailing wind patterns. 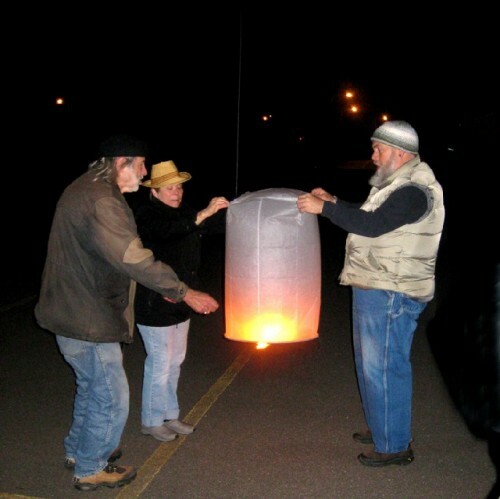 The lantern had to be fully inflated in order to lift properly and clear neighboring buildings. There proved to be little wind and the lantern when launched soared vertically ever higher. It seemed to last for a very long time as we watched it drift off ever farther away. An enormous cheer went up as more and more people arrived for the special event. "This is more complicated than I thought" Brill commented as it was difficult to properly ignite and control the lanterns. But with the success of the first launch he decided to release a couple more. Each launch was accompanied by excited applause. Roman who was photographing the event said that he had seen videos on U Tube of festivals in Cambodia when hundreds of the lanterns are released creating a spectacular effect. 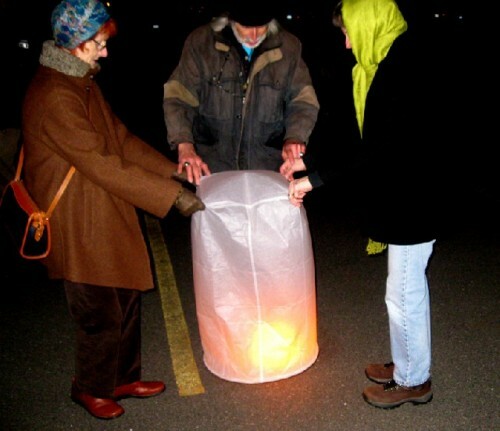 The lanterns which were not launched eventually were stomped to the ground and burned out. There were no problems and overall the sky art event was an unqualified and exhilarating success. We ended the evening on a bridge looking at the light show and a laser projected Mermaid as well as swimming trout. We look forward to next summer and another version of the Hoosac River Lights. Hope it doesn't rain. "Thank you Ralph Brill for your commitment to the city of North Adams, your enthusiasm for its River, and your interest in its history. We appreciate it!"